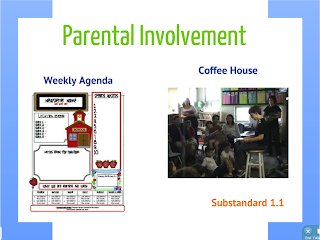 In order to engage parents more in the middle school classroom, an effective teacher may plan to send a weekly agenda home with his or her students. This agenda could outline the various topics being discussed in class as well as the homework assigned for the week. This could help parents become more familiar with what their youth are learning in class and hopefully allow them to be more supportive. Another activity teachers may do in order to increase parental involvement in the classroom is to host a “Coffee House” each semester. This will be a day in which students read aloud or present any of their works throughout the year. Teachers should encourage parents to attend this event. This would allow the parents and teachers to become more familiar with one another. It will also show the students that their parents support their school activities.